So, I deemed it was time to move on from OS X Lion to Mavericks. From a previous inquiry, I found out that my version 7 of Parallels Desktop wouldn’t run on Maverick. After waiting for quite a while, last Christmas netted me a deep discount for its iteration number 8. I nailed a full version of Parallels Desktop 8 —which will enable me to run my existing VM on Mavericks— for just a buck after mail-in rebate. Woohoo! I know it’s not the latest version, but I really think that the price at that level is very reasonable. When your OS is free, is it really worth for you to get Parallels Desktop for at least 59 bucks? Nu’uh. Not in my dictionary. Yesterday, with both Mavericks and Parallels Desktop 8 in hand, I decided to make the plunge. The transition to Mavericks was seamless and a breeze. Unfortunately, this wasn’t the case with Parallels’ upgrade. To be exact, the upgrade itself was fine. However, after I ran my VM, it detected that my Parallels Tools was out of date, tried to install it and ultimately failed with the error “There was a problem updating Parallels Tools” shown on a red “Parallels Tools Installation Agent” window after showing progress of 15% and sometimes 24%. I tried everything I could. I followed the instruction on said window to reboot. I rebooted like a gazillion times to no avail. I turned off Windows Security Essential based on a Parallels KB that said antivirus software might halt installation. I turned off Windows system restore on all my disk. I uninstalled Parallels Desktop completely and reinstalled it. Nothing yielded any result. So, here are the list of actions I’ve taken that allowed me to install Parallel Tools on my VM. I found out that Parallel Tools .iso and related files aren’t where they’re supposed to be. So, several links pointed out that the files “prl-tools-win.iso” and “prl-tools-win.tar.gz “should both be inside the path “/Library/Parallels/Tools”. Problem is, I didn’t even see the name of the folder. 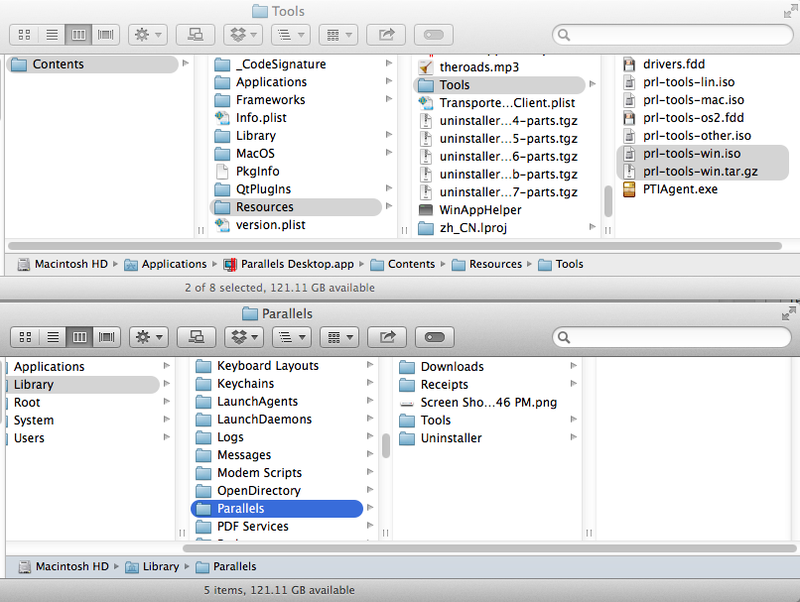 All I saw in the Parallels folder were “Downloads”, “Receipts”, and “Uninstaller” folders. “Content/Resources/Tools” folder to “/Library/Parallels/Tools” folder after, I created the “Tools” folder. This way, all the required files are where they supposed to be when I mount the images in my VM. I killed the unresponsive “Parallels Tools Installation Agent” window with Task Manager. At this point, that darned window wouldn’t close and won’t minimize. It just stared blankly, giving the only option of rebooting the VM. It took me two attempts with Task Manager to kill it. I uninstalled “Parallel Tools” from Control Panel’s Add/Remove Programs dialog. If the darn thing’s giving you trouble by throwing error message “Error 2738, Could not access VBScript run time for custom action”, follow the instructions here. For me, the command on the bottom worked (I had a 64-bit system), but I had to type it precisely since I don’t have clipboard sharing enabled —thanks to missing Parallel Tools. I rebooted my VM. Just to make sure. I mounted the Parallels Tools .iso onto the VM. Instead of running the autorun script, I browsed the virtual CD. And from then, I ran the “PTAgent.exe” file as Administrator by right-clicking on it and selecting “Run as administrator” from the menu. Finally, the installation agent ran smoothly this time. There you go. I got my Parallels Desktop 8 working on OS X Mavericks. Hopefuly you’ll get yours working too. I had the same problem with Parallels 9 and Mavericks. I was going through the time consuming and dead end suggestions from KB before I found your post, Thank you! Hi, thank you for your post. I followed your instructions, but it didn’t work :( My installation always stops at 40%. Any suggestions? Nope. Can’t help you there. Sorry. Have you tried uninstalling all antivirus programs and such? This entry was posted on Sunday, 9 February 2014 at 17:39 and filed under Excerpts from the Real World. You can follow any responses to this entry through the RSS feed.